The Writers Guild of America, East (WGAE) and the Writers Guild of America, West (WGAW) have announced nominations for outstanding achievement in television, new media, news, radio, and promotional writing during 2015. 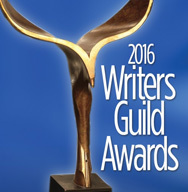 Winners will be honored at the 2016 Writers Guild Awards on Saturday, February 13, 2016, at simultaneous ceremonies in New York City and Los Angeles. The Writers Guild Awards honor outstanding writing in film, television, new media, videogames, news, radio, promotional, and graphic animation categories. The awards will be presented jointly at simultaneous ceremonies on Saturday, February 13, 2016, in New York City at the Edison Ballroom and in Los Angeles at the Hyatt Regency Century Plaza.